Week 13 is here. The Patriots aren’t their usual dominant selves this year — will they beat the Vikings this Sunday? 🙌 Ryan Gnizak is at the top of our Week 12 leaderboard with 263.5 points. 🏆 Greg Chili Van Hollebeke is in first place on our overall leaderboard with 934.5 points. 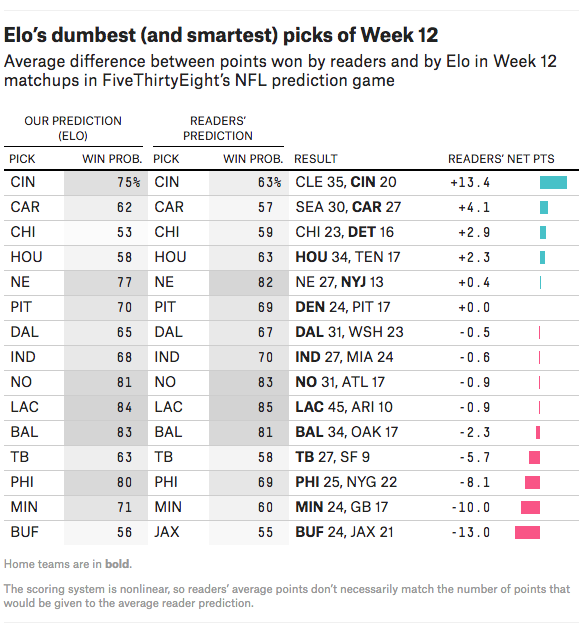 FiveThirtyEight’s Elo model is in 765th place with 536.8 points.